In this article, we'll teach you how to use your already-qualified leads to hone the targeting of your Messenger Ad campaigns using a Facebook Engagement Custom Audiences synced from MobileMonkey and Facebook Lookalike Audiences. Lead generation is one of the most popular and in-demand use-cases for a MobileMonkey Chatbot. It has never been easier to gather contacts using one of our many Lead Magnets, and to gather some qualifying information from them via a Chat Form. The first step in any lead-qualifying Chatbot is to create a Form that asks new visitors for the information you care about! Once you have some qualified leads, the next step is to build an audience of Contacts who meet the criteria you count as "qualifying." This is where the magic happens. Take that audience, and click the Sync Facebook Custom Audience button! NOTE: You may notice that in this image, dialogues are referred to as "pages". For your convenience, pages were renamed to dialogues on 1/22/19. Learn more. This will send all of the contacts you have in the audience to Facebook as a brand new Custom Audience. Better yet, it will keep that audience in sync with Facebook as new Contacts are added! 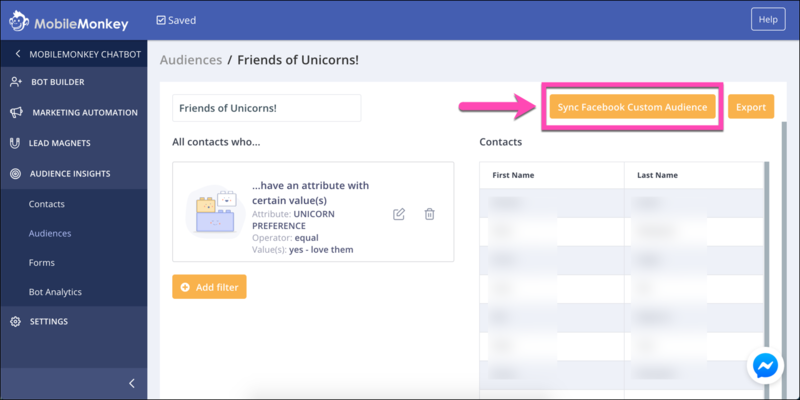 Note: If you haven't connected your Facebook Page to one of your Ad Accounts, you can do so by clicking the Gear icon on that Facebook Page from the Dashboard. Last step! In Facebook, from your Facebook Audience Manager click Create Lookalike Audience. In the ensuing pop-up, choose your MobileMonkey Audience as the source, narrow down to locations if you'd like, and then click Create. Now just create a Messenger Ad that with this Lookalike audience as the audience target, and not only will you get great new contacts who are extra likely to qualify as leads, but as new leads come in and get qualified, they will be sync'd to Facebook to train your Lookalike Audience! It's a feedback loop of awesome. Go bananas!